When I was first diagnosed with Type 2 diabetes I was sent to a Diabetes educator who gave me a basic explanation of my future life with Diabetes, and some materials to take home to study to learn how to Eat for Diabetes. The talk about my future was essentially preparing me to accept that Type 2 Diabetes is a progressive disease, that from this point on it will only get worse. With drugs and lifestyle changes my most optimistic future was to try to slow its inevitable progression. But if my disease progressed quickly I could expect to lose my eyesight from diabetic retinopathy, have kidney disease, perhaps some amputated limbs and all the while with a 4x greater risk of cardiovascular disease. I’m convinced these pamphlets are just advertising to get Diabetics into the clutches of Accredited Practising Dietitians … but woe betide the poor diabetic who trusts these folk to navigate them through this minefield. Apparently an APD can tell you how much carbohydrate to eat (hint: the answer is almost none). I entered the suggested meal plan into a dummy account in MyFitnessPal so I can share it. You can go to the MyFitnessPal link here but this is a static view of how to “Eat for Diabetes”. 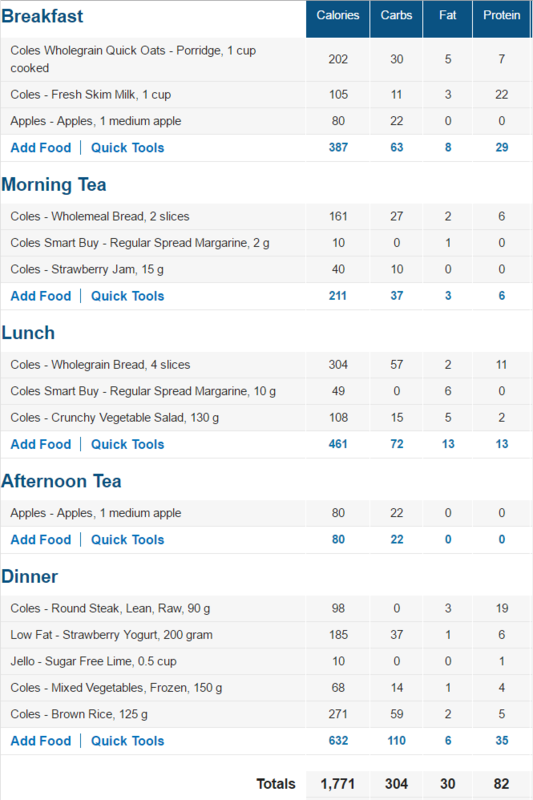 The rules I set for myself were that I just used home brand versions of everything from Coles – and while I arrived at 1771 kCal and they claim the meal was 1600 kCal … I think my effort would be a reasonable person’s attempt to shop for all the foods in the document. I just want to point out that this is what Diabetes Australia and the Dietitians Association of Australia suggest for a Type 2 diabetic, someone with an established inability to safely metabolize glucose. 304g of glucose. Let’s see … a teaspoon of sugar is about 4g of glucose, right? So that would be the equivalent of eating 76 tsps of sugar. I’m ashamed to say I believed all this nonsense for years despite knowing that glucose could only be bad for me. I had a bad case of cognitive dissonance.